New York Gov. 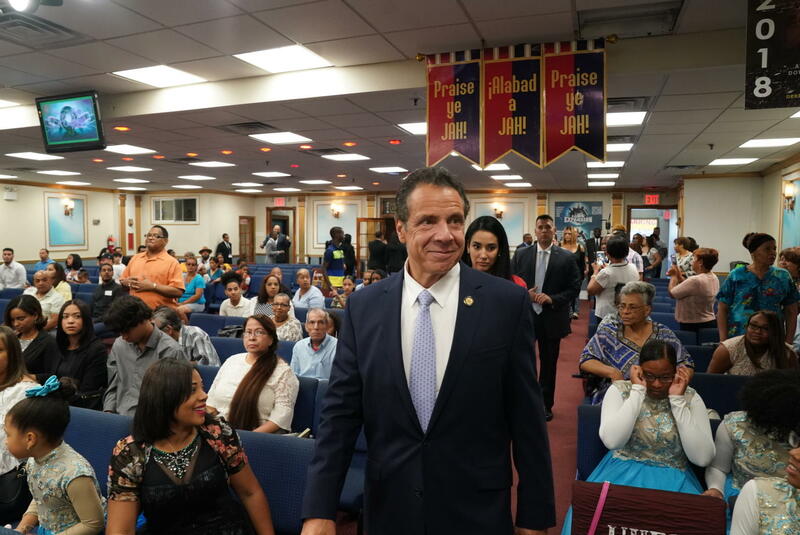 Andrew Cuomo told a congregation Sunday that he would help families sue President Trump and his administration for failing to provide adequate assistance to those affected by Hurricane Maria. Cuomo said the Trump administration violated Puerto Ricans' Constitutional rights of equal protection under the law. He said that New York stands committed to helping victims of Puerto Rico rebuild after the deadly storm walloped the island in September 2017. "President Trump never tried to help Puerto Rico. Florida got attention, Texas got attention, and Puerto Rico got the short end of the stick. That is not just wrong and unethical and despicable, it is also illegal," Cuomo said Sunday at the Heavenly Vision Christian Center in the Bronx, New York. "We're going to hold 'King' Trump to the Constitution of the United States, and the Constitution said equal protection under the law. Puerto Rico did not receive equal protection under the law," Cuomo said. "New York is standing with Puerto Rico the way we said we would. We are going to fight back and we're going to show this president that the law is the law." There were no immediate details released about Cuomo's plan nor did he take any questions at Sunday's event. Cuomo, who is a seeking a third term as governor, also took swipes at Mr. Trump's border wall and how the president reacted to the aftermath of a white nationalist rally in Charlottesville, Virginia, last year. "Somebody has to stand up to this president. He is a bully," Cuomo said. Cuomo's speech Sunday comes on the heels of a report out last week that said Hurricane Maria is now considered the most deadly U.S. natural disaster in the last century. Puerto Rico's government requested an independent review by George Washington University, which found Maria killed an estimated 2,975 people – more than 46 times the original official death toll of 64. "The focus shouldn't be, you know, hey, let's blame all these folks. The focus should be who's going to be accountable and who's going to take the action so this doesn't happen again," Rosselló said. Researchers found the government and hospitals were inadequately prepared for the Category 4 storm. They also found the risk of death was 45 percent higher for those living in low-income areas on the island, and elderly men were at the greatest risk of dying.